With an estimated 86 million Americans diagnosed with pre-diabetes, and a further 29.1 million having being diagnosed with diabetes,1 it is time to take a serious look at the nutrients that can help regulate or reduce the factors that are responsible for diabetes. 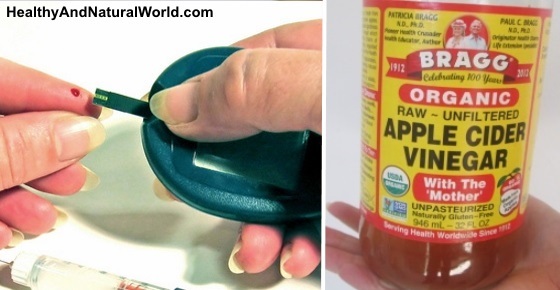 Lets have a look at how you can use apple cider vinegar (ACV) for diabetes (type I and type II). Diabetes is classified into type I and type II diabetes. In type II diabetes, two of the biggest factors responsible for the condition are blood sugar and insulin levels. Type II diabetes occurs when you lose the ability to regulate blood sugar levels, either as a result of insulin resistance or because of a lack of insulin. Nutrients that facilitate the ability to regulate blood sugar levels are therefore highly beneficial for helping individuals reduce or treat type II diabetes. ACV has gained a reputation as one of these nutrients. I have already mentioned the amazing health benefits of ACV and about the 11 ways you can use it to revolutionize your health. Here are a number of studies that show you how to use apple cider vinegar for regulating blood sugar and how much you need to consume. Certain diabetes medications are designed to block the digestion of sugars and starches. By blocking the digestion of these compounds, these medications can effectively prevent blood sugar spikes, and they can therefore help to regulate healthy blood sugar levels. Meals can pose the biggest problems for individuals who suffer from type I diabetes. When you eat, the sugar and carbohydrates contained in your meals are converted into glucose, which enters the blood stream. For patients with type I diabetes, this sudden increase in blood sugar levels can be dangerous. In a study published by the American Association of Diabetes, researchers found that apple cider vinegar helped to decrease the blood sugar levels after meals in type I diabetes patients.3 The conclusion of the study suggests that adding two tablespoons of apple cider vinegar to a meal can be very effective in helping to regulate blood sugar levels after the meal. Insulin resistance plays a very important role in some patients who have been diagnosed with type II diabetes. Finding healthy ways to improve insulin sensitivity is therefore highly beneficial for these individuals. In a study published in Diabetes Care, 29 patients were given 40 grams of apple cider vinegar with 40 g of water and 1 teaspoon of saccharine after a meal composed of a white bagel with butter and orange juice. Blood glucose levels and insulin levels were measured to ascertain whether apple cider vinegar had an effect on insulin sensitivity. ACV is not only effective in individuals with type I or type II diabetes. In a study published in the European Journal of Clinical Nutrition, researchers studied the effects of the acetic acid from vinegar on the blood glucose response after a meal in healthy people. ACV may even be beneficial for helping to regulate fasting blood sugar levels which are your blood sugar levels after a period of fasting. These levels are most often determined when you wake up in the morning before you eat anything. In a study published in Diabetes Care, researchers studied the effects of two tablespoons of apple cider vinegar at bedtime to determine if ACV had an effect on fasting blood glucose. How Much Apple Cider Vinegar Should You Take for Diabetes? A tablespoon or two of apple cider vinegar seems to be sufficient to obtain the benefits associated with apple cider vinegar and blood glucose regulation. To help regulate blood sugar after a meal, adding two tablespoons of apple cider vinegar to your salad dressing or to a glass of water could be sufficient to help regulate blood sugar levels after your meal. Some people like to consume apple cider vinegar together with garcinia cambogia as this plant has shown in research to improve blood glucose readings and reduce insulin resistance. For the purpose of regulating fasting blood sugar levels, two tablespoons of vinegar at bed time could also be beneficial for regulating your blood sugar levels while you sleep. Adding two tablespoons of apple cider vinegar to a glass of water before bedtime could therefore help you to manage blood sugar levels. As a general note, don’t consume undiluted apple cider vinegar as it erodes tooth enamel and can cause burns to the sensitive tissues in the mouth and throat. Related: How Much Apple Cider Vinegar Should You Drink? Many people like to add honey to their ACV to offset the acidic taste and to enjoy the combined health benefits of apple cider vinegar and honey. Although honey offers some health benefits, it is important to understand that honey is mostly sugar and it increases your calorie and carbohydrate intake. For managing diabetes, honey should be calculated as part of your total carbohydrate intake. Various studies on honey showed that it may not have the same impact on blood sugar levels as sugar does. If you have well-managed diabetes, are not overweight and are otherwise healthy, then honey as a replacement for sugar can be beneficial.7 If you have any doubt, it’s best to consult with your doctor. Using ACV is also one of the 70 habits featured in my e-book 70 Powerful Habits For A Great Health which will guide you how to take positive steps to improve your wellness and overall health. I have several articles about diabetes and you can use the “search” option in my website (located at the top right hand or at the bottom in some mobile devices) to access the information. Hi Nicky, there are conflicting opinions about this issue. According to webMD website, not enough is known about the safety of using ACV during pregnancy and breast-feeding, so they recommend to stay on the safe side, and not use it. I would consult with your doctor first before consuming ACV. Oh my goodness, I have always made my own salad dressings and consumed ACV all the way through my two pregnancies. I would not be afraid. It is healthy and actually helped be with heartburn when I was pregnant with my son. Make it in your salad dressing. Mrs. Braggs Organic, with a high quality Olive Oil is the most beneficial way to consume. I would not think that your doctor should have a problem with this, although M.D.’s get slim to none when it comes to nutrition in Medical School. Slim to none. You should have given birth about the 9th month. You are well over-due!!! LOL!!! Thanks for that, I needed a good giggle! This article is informative and helpful, I just bookmarked it for future reference, thanks alot for sharing! Type 2 diabetes mellitus is a lifelong disease, but also a controllable disease, in milder cases, type 2 diabetes can be easily reduced or controlled by certain dietary changes, regular exercise, while more serious cases, Diabetes is treated with a combination of healthy meal planning, physical activity, medications, and perhaps insulin. Iv taken ACV with honey last 2012. I noticed that I started to lose weight and I dont get that hungry feeling anymore. Is it an effect of the ACV? It might be as ACV is also used to aid weight loss – see more in my article How To Use Apple Cider Vinegar (ACV) For Weight Loss. ACV is one of the tools that can help you lose weight as mentioned in my article on How To Use Apple Cider Vinegar (ACV) For Weight Loss. However ACV will not provide you with a quick weight loss, and is not a magic solution for that. Losing weight depends on other factors as well, such as exercising, nutrition, stress and genetic factors. ACV is just one of the tools to help you reach your goal faster and needs to be combined with other techniques for losing weight for best and fastest effects, so the function of vinegar gets supported with lifestyle changes. So I don’t think you need to worry about losing more weight with ACV. I am a type 2 diabetic,my sugar don’t run real high tho.i just need to know how much I should a day? I just started,and I put 2 tsp to 8 oz of water,3 times a day before meals,Is that too much? Also it was said that the vinegar decreases potassium.i take perscription potassium 20 mg 2 times a day.so would that help mine not to go down too low? I also take cinnamon capsules twice a day,and the Garcinia Cambodia,twice a day,started that bout 4 days ago.i take metformin, antidepressant,and an aspirin,and blood pressure,is this combination alright? Tks Rhonda T.
When considering most of the studies concerning ACV, then a tablespoon or two seems to be sufficient to obtain the benefits associated with ACV and blood glucose regulation. The decrease in potassium is only when taking excessive amounts for a long periods of time. You’ve mentioned that you take Garcinia cambogia and cinnamon supplements. I’m not sure which type of cinnamon you take, but the best type to take is Ceylon Cinnamon (and not Cassia Cinnamon) – you can read about the difference between the two types in my article – Ceylon cinnamon is more closely associated with potential health benefits involving blood sugar regulation and is very low coumarin levels. Coumarin is a naturally occurring toxin which has the potential to damage the liver in high doses, and cassia cinnamon is a main source of coumarin. So for people who are cinnamon lovers and consume large amounts of cinnamon, Ceylon Cinnamon is the best choice. You also need to be aware of the fact that natural supplements may interact with certain medications. As I’m not a doctor, and since you take medication regularly, you need to talk to your doctor before you start using cinnamon and Garcinia cambogia supplements as they may interact with medications you currently take. Hi I am type 2 diabetic and I am on insulin.The insulin I take is Lantus 46 units and Apidra 6 units.I take the Apidra before my tea.I was on Metformin but now I only have a half a table in the morning and half at night.Was on 2 in the morning and 2 at night but I was going to the toliet all the time.Once I stopped my bloods have gone up high.I have now tried Apple cider vinegar and my bloods for the last 3 days in the morning 5.3 and this morning 5.4.I am very happy about my bloods now.Just a bit worried about the insulin I am taking.I have 1 tablespoon of Apple cider vinegar with water before my tea. Hi! I have type 2 diabetes. Although now pre-diabetic, I would like to reduce my dose of metformin. After reading the article and other readers questions, I think 1-2 Tbsp of ACV diluted in water is the way to go but I’m confused. Should it be consumed before or after my meal and also at night before bedtime? That would make it 4 times a day right? Many recommend to consume it up to 3 times a day usually before meals, as ACV helps digestion. For my experience dont take acv if you want to drink alcohol or brandy afterwards you get black out or you do things that you cant remembered, it happened twice to me so my husband asked me what i have taken before drinking brandy since i dont take any medications and i remembered i drink acv that afternoon the first time. We drink brandy almost everyday. The 2nd time for experiment i take acv again with brandy and am not too much drunk still i got black out or i did things i cant remembered when i woke up. And i lose weight without trying..
how much acv should you use if it says 20 grams to 40 grams of distilled water. I don’t know much about grams. If you consider most of the studies concerning ACV, then a tablespoon or two of ACV diluted with a cup of water seems to be sufficient to obtain the benefits associated with ACV and blood glucose regulation. See more information at the end of the article under the title “How Much ACV Should You Take for Diabetes?”.